Front row, left to right, Washington C.H. City Manager Joe Denen, program coordinator for Master Gardeners, Sara Creamer, and Fayette County Commissioner Jack DeWeese; back row, Natural Resource Specialist Fayette SWCD Brigitte Hisey and Fayette County Commissioner Tony Anderson. Washington C.H. City Manager Joe Denen and Fayette County Commissioners Jack DeWeese and Tony Anderson are taking action to help save the monarch butterfly, an iconic species whose populations have declined by 90 percent in the last 20 years. Through the National Wildlife Federation’s Mayors’ Monarch Pledge, cities and counties are committing to creating habitat and educating citizens about how they can make a difference at home. The Fayette Soil and Water Conservation District and OSU Master Gardeners are helping to make this happen. Plans are underway to plant pollinator plots in the city and county. One way citizens can help is to plant milkweed plants. Monarchs needs milkweed to lay their eggs. The Fayette Soil & Water Conservation district is selling swamp milkweed. It is one of my favorite plants, said Brigitte Hisey, natural resource specialist. With a little extra watering it is a great choice and is very attractive. It blooms from June to August. People can buy plugs for $2 a piece until March 22. We also are selling other native pollinator plants. In the winter of 2016, 10 acres of monarch butterflies covered the forest in Mexico, their winter home. This year only 7.18 acres were covered. This is still up from the low of 2013 when only 1.6 acres were covered by migrating butterflies. This spring think about planting a wide variety of native bushes and flowers. The more diversity the better the habitat. Every planting counts, it all adds up. Help build a better community one habitat at a time. For more information on the plant sale visit us on Facebook, email brigitte.hisey@fayette-co-oh.com or call the Fayette Soil & Water Conservation District at 740-313-3212.
https://www.recordherald.com/wp-content/uploads/sites/27/2017/03/web1_DSCN0101.jpgFront row, left to right, Washington C.H. 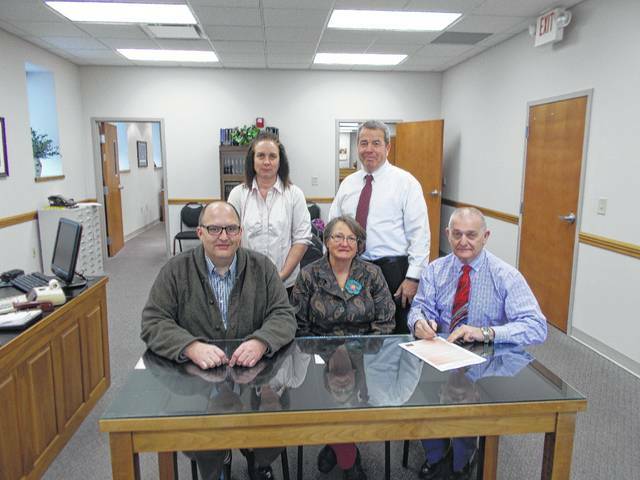 City Manager Joe Denen, program coordinator for Master Gardeners, Sara Creamer, and Fayette County Commissioner Jack DeWeese; back row, Natural Resource Specialist Fayette SWCD Brigitte Hisey and Fayette County Commissioner Tony Anderson.